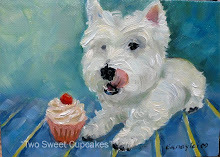 Living in the country enjoying a westie dog, painting with watercolor, acrylic, oil, and gardening. Loveliness. Another lovely White Wednesday today. Here is what I did in one hour today. I tried to take some pictures of lace and leather which happens to be my skirt and my cowgirl boots. I think it's a great contrast of textures. My husband is not too thrilled when I wear these boots out to town with skirts. "Aren't they hot?" he'll ask. Psychology is amazing; isn't it? Soon we had fur, lace and leather. More white textures. (I also found out you can only bend over so far and take a picture before falling over.) I made a mental note to get a tripod and use the timer next time. Hopefully I will not forget the camera and run inside. The mind is amazing; yes? Mine is full of goings-on and at times I think it's unraveling, but I graciously gather it back up and keep going. Our little romp outside turned into a fur party. Just sit down on the grass and everyone climbs on board. If someone would have opened the gates the sheep would have been upon us too. Sir Salty, our westie dog, is being patient and trying to share the love, but it's hard. Etsy says to share the love. I can't believe how fast the kittens are growing up. They used to be these fluffy "antique white" balls just a few weeks back! I ended up looking back on my camera of all the stored pictures there. There are about 60 percent animals and 40 percent people. 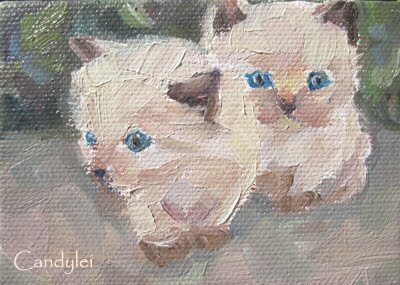 What came of our day was a little aceo oil painting of our siamese kittens. I paint rather fast and all in one sittng. I feel that gives a better impression, better brushstrokes and it's not overpainted. You have to simplify, just put on the canvas what's important. Do visit the other white wednesday ladies and gents posts here. 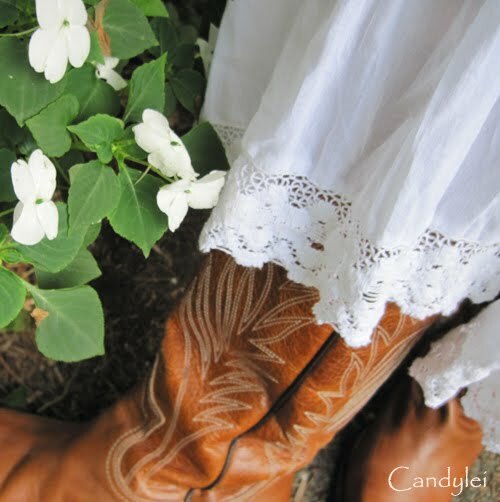 I love those boots with the white frills! Your sweet dog is just beautiful too-what a cute name! What do men know about fashion anyway?? 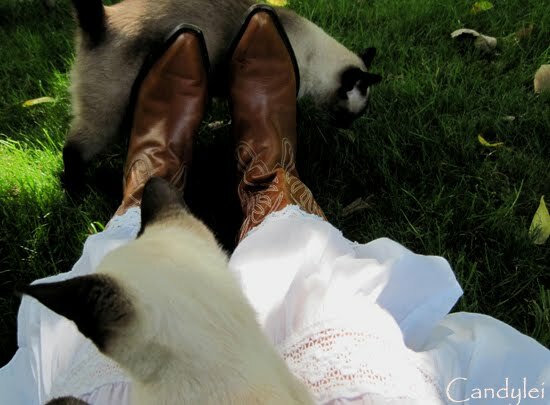 ?..unless they're gay of course ;).... your cowgirl boots are great with your skirt. 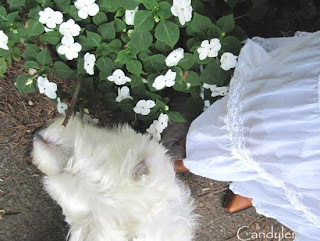 This is a charming post...love the boots and frilly skirt! 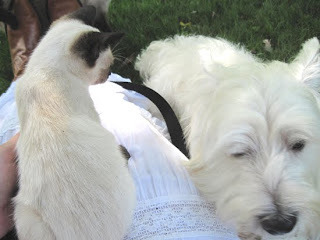 And of course your furry friends are adorable, always the best part of any day! Hello there! This is great! 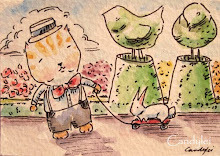 You have a terrific talent and beautiful dog/cats. I'll be glad to answer questions about my art through email. I'll respond within 24 hours, and if I don't, send me another email to be certain. 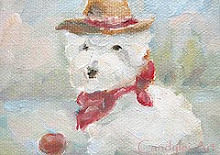 My email address: Candyleifolkart@yahoo.com Art is my passion. I am most happy with a shovel and a paintbrush. 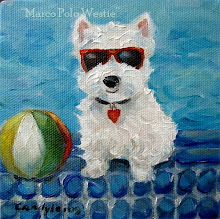 Our family includes a westie, West Highland White Terrier, who is known as Sir Salty. He fits right into our little homesteading farm. Spunky, fun and loyal. Always ready for adventure. This is a Flickr badge showing public photos and videos from Candylei. Make your own badge here. Garden Design is much like a painting. It's not just about COLOR...it's about DESIGN. You can never have enough boxwood or evergreens, I believe. Design, meaning 12/365...How will it look in the winter?